On this page we've tried to answer many of the most frequently asked questions, but please feel free to call into the shop, freephone 1800 855 835 or email bridal@themoderne.com if you have any queries. Take a look through our selection of bridal dresses, and make note of any features or particular styles which appeal to you. It is also useful to browse and collect images on sites like Pinterest, or do it the old fashioned way and cut pictures from magazines. The best way to get in touch is to give us a call on freephone 1800 855 835. If you prefer, you can email bridal@themoderne.com or fill out our appointment request form and a member of staff will contact you to confirm. Our Saturday appointments can fill up 2-3 weeks in advance, so early booking is always advised. The store is open from 10am to 6pm, Monday to Saturday. From January 2015 we are open on Sunday's by appointment only. Appointments are required for bridal fittings, but not for bridesmaids, debs or communion wear. To read Facebook reviews from our customers, please click here. Your appointment will last an hour and we recommend bringing someone whose opinion you trust- though bringing too many people can make decisions harder! We’ll keep track of what you do and don’t like, so there’s no need to worry about getting overwhelmed. We have three large fitting areas over our top two floors so brides are always guaranteed privacy, as well as the attention of a dedicated stylist. Your bridal consultant will help you to browse through our collection, try on gowns and suggest accessories. Bring an open mind, be prepared to love dresses you might not have expected to and don’t be surprised if you find THE dress on your first visit! Your expert stylist will work with you to identify the shape, style and shade that makes you look and feel amazing. No, we do not charge for private fitting appointments. We do not allow photographs in bridal fittings, though once you have purchased your dress you may take as many photos as you’d like. Please don’t wear too much make up or fake tan. We would like to protect the sample dresses, but it’s best for you to see what works with your natural colouring too. We recommend wearing good quality underwear and bringing a strapless or multiway bra with you. If you have already decided on any accessories, please bring those along too. What sizes are in stock? Most of our bridal gowns are available in sizes 6-30. Our top floor bridal suite holds a great range of gowns specifically designed for the curvy bride and these are available up to a size 36. A 50% deposit is payable upon ordering and we recommend doing so at least six months before your wedding date. Your dress will arrive in approximately 4 months and we advise allowing 2 months for any adjustments which may be required. A select number of gowns can be ordered as a 'rush cut' with delivery in about 8 weeks. Please call us on 1800 855 835 to find out more. Alterations are not carried out in store, but we would be happy to recommend a seamstress. Once your dress has arrived in store, we will notify you and invite you for your final fitting before you take it home. If needed, we can safely store your gown until closer to the big day. Generally you won't need an appointment for bridesmaid fittings- we invite customers to call into the store whenever suits. However if you are dressing three or more bridesmaids, or plan to come in on a Saturday, we would recommend making one so we can ensure you get the attention you need. While some of our bridesmaids dresses can be bought off-the-rack, most are made to order and come in a wide range of colours: please visit our store to view fabric swatches. We recommend allowing at least 4 months for made-to-order gowns to arrive instore. You can see our full range of bridesmaid dresses here. If you wish to order multiple dresses in the same colour, we advise ordering them at the same time. This will ensure they come from the same bolt of cloth and avoid any slight variations in the colouring. You can view our range of flowergirl and junior bridemaid gowns here. Some styles are available to order in a range of colours: please visit our shop to view fabric swatches. No appointment is needed to view and try on these dresses. You do not need an appointment to view or try on debs gowns or communionwear, just call in to the store and we'll be happy to help. We stock a carefully selected capsule range of debs and grads dresses and do our best to help avoid same-dress disasters by taking note of schools. We also stock a great range of shoes and clutch bags in a variety of colours. Seasonally, we stock a wide selection of Communion dresses, shoes and related accessories including umbrellas and gloves. You won't need an appointment to see our range of ultra comfortable designer shoes and bridal accessories either. Drop into the store and a sales assistant will be happy to help you. No problem! Most of our designer shoes can be hand-dyed to order. Simply bring a swatch of fabric in the colour you wish to match. 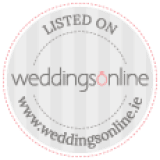 This service is ideal for the bride who wants to add a pop of colour with her footwear, for bridesmaids, debs or formal wear or re-using your white or ivory shoes after the big day. Please call in to the shop or freephone 1800 855 835 for more information. Please remember that colours shown online can vary depending on the device you use (ie PC, tablet, phone), so we always recommend visiting the store to make sure an item is exactly the right shade you're looking for.